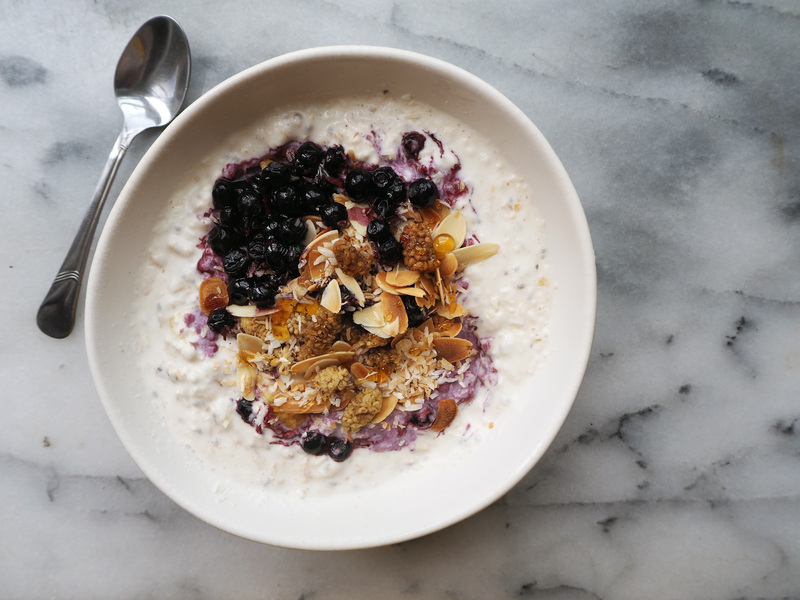 Here is the thing: toasting oats bring out their flavour like crazy. They start having a nice, slightly nutty taste. According to your wishes you can toast them until they get quite brown or lighter and you can do it with a pan or in the oven (I made in the oven). In any case, the taste is elevated to a whole new level. 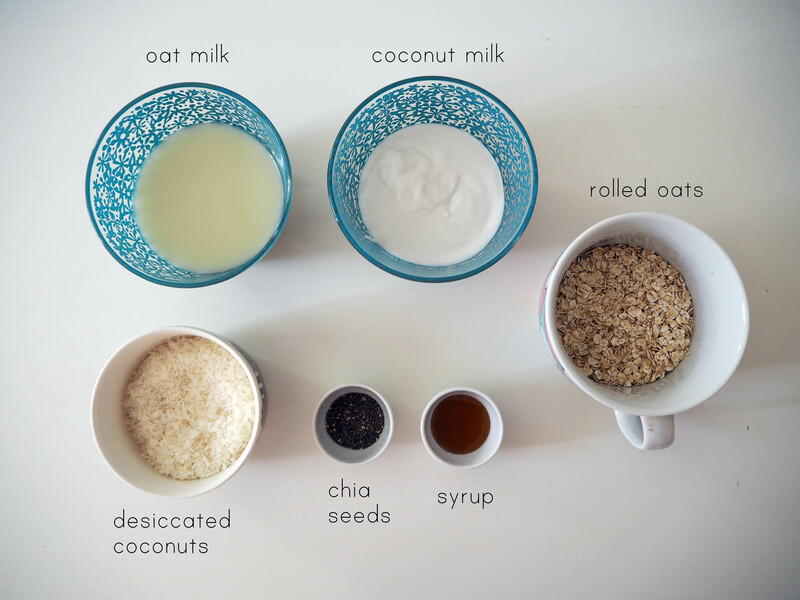 For overnight oats I always use the same liquid combination: 2:3 portion with coconut:oat milk. 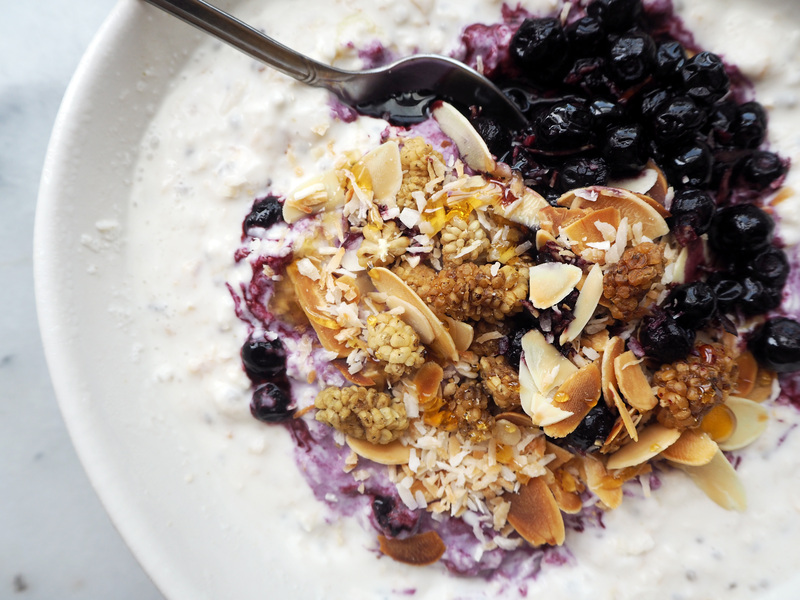 Coconut milk adds a lot of flavour to oats and makes the whole thing very rich. To make it even more coconutty, I added desiccated coconut to the oats. I am not the biggest fan of desiccated coconut when it is raw, so I toasted it the same way as oats. Result: one more level up in taste! From that point on, you can get quite creative. I had some dried mulberries at hand, some frozen blueberries, a bit of toasted almonds etc. so I used those as toppings. 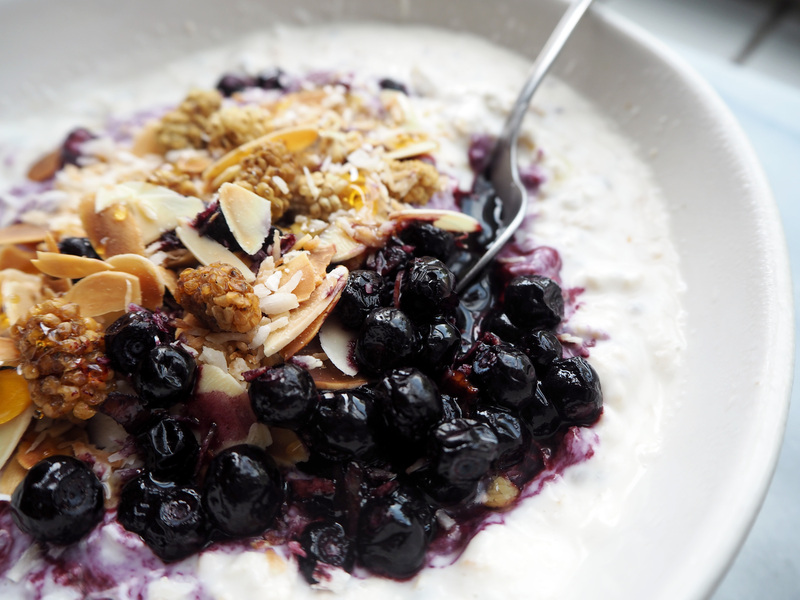 You can use other favourite toppings if you like: other berry types, nut varieties, maybe even a little chocolate! 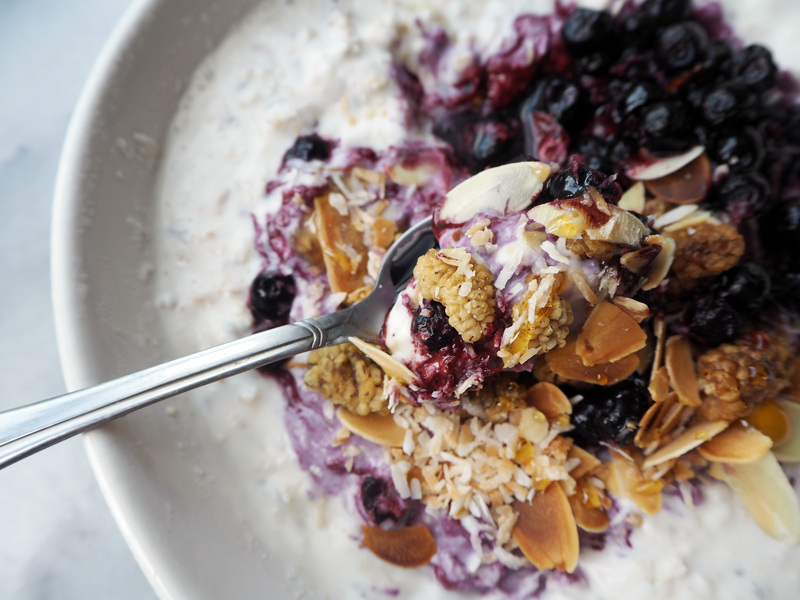 Make your oats at night and eat in the morning right away with toppings of your choice. Easy peasy and very filling and nutritious! 2. 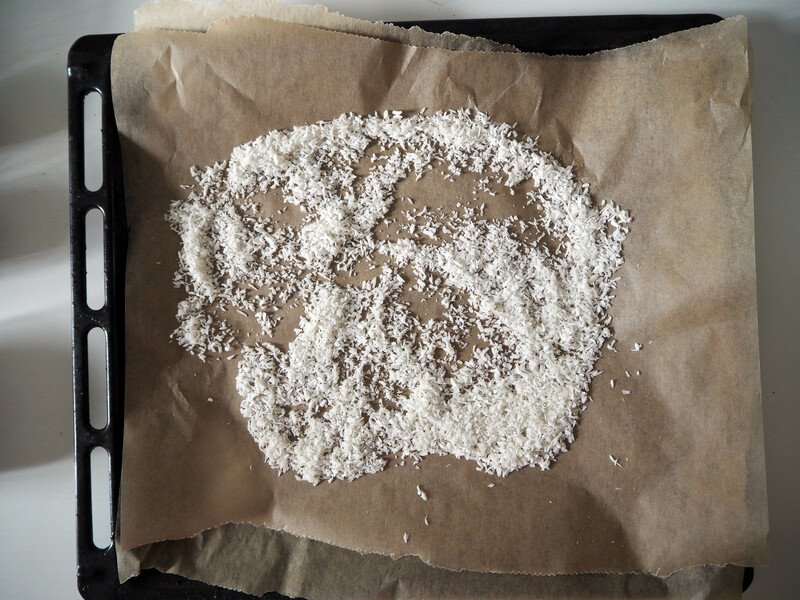 Put baking paper on an oven tray. Spread oats – so that they don’t overlap much. 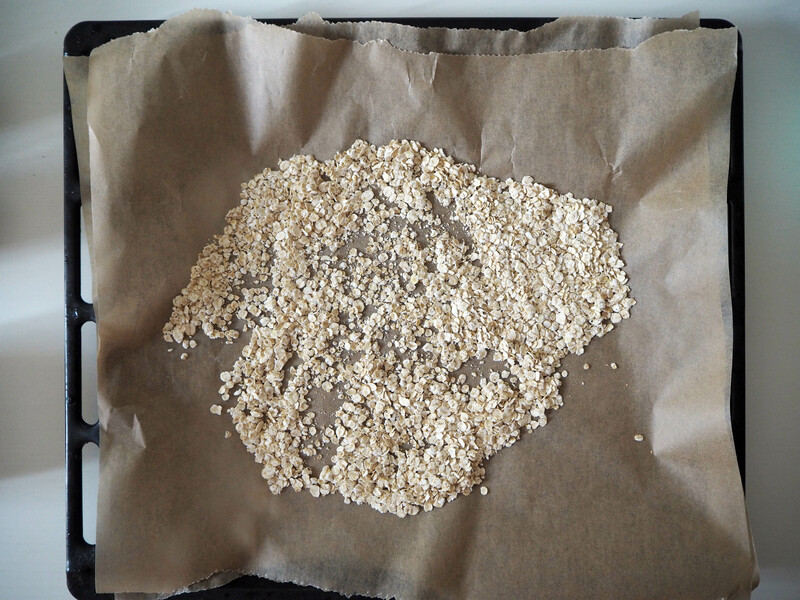 Toast the oats in the oven for about 5 minutes, until they get golden brown. If you want more toasted, you can leave them in the oven longer but be careful not to burn. When toasted enough, take out of the oven and leave to cool. If you like toasted oats, and if you are making overnight oats often, then you can toast the oats in larger batches in advance. 3. After oats, toast the coconut the same way, for about 5 minutes. Be careful and watch coconut closely in the oven, it might get too brown quite easily. When it is done, again take out of the oven and leave to cool down for about 10 minutes. 4. 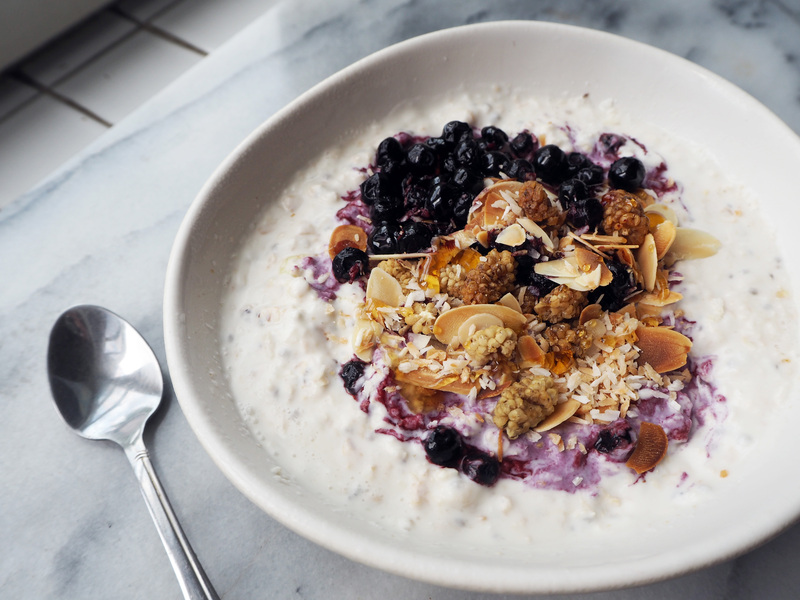 When the oats and coconut are cooled down, mix oat milk, coconut milk, chia seeds and syrup in a bowl. Add some of the coconuts in this mixture. I am not giving an exact amount for this because it depends on how much you like coconut. But about 1-2 tbsp for each portion at least is quite good. At this point, you can leave the whole portion in the fridge and choose to distribute between smaller portions in the morning, or you can directly make / distribute in individual portions and put those in the fridge separately. In the morning, just take the portion you like and add your toppings. Enjoy!